Choosing the optimal location for care is one of the most important factors in making healthcare decisions. Patients might want to access a facility in their town, but healthcare providers often want to get patients to the center that provides the most appropriate care. Geomarketing. Geomarketing solutions let healthcare providers create patient-centered communications that guide patients to the appropriate care. To reach patients in a specific geographic area, healthcare marketers can target their mailing list with GEOservices. Marketers can then include a personalized map with their communications that guides patients from their homes to a healthcare center. 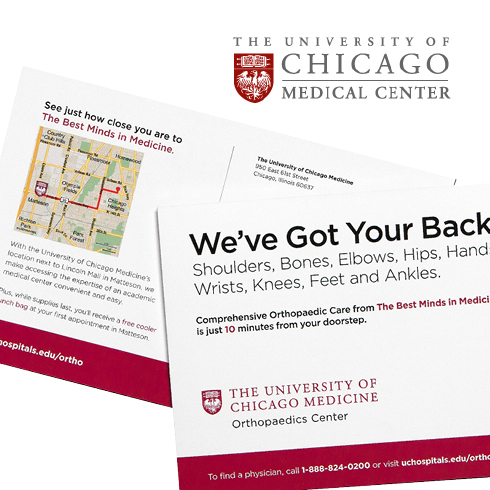 When the University of Chicago Medical Center wanted to direct patients to a newly opened medical center closer to their homes, the center’s staff used locr geomarketing solutions. By including a personalized map on a direct-mail postcard, the healthcare provider saw an immediate increase in appointments at the new center. Click here to learn more about the University of Chicago Medical Center’s story. locr will be exhibiting at SHSMD Connections 2017, the annual conference in the US-based Society for Healthcare Strategy and Market Development. At the event, locr will highlight geomarketing solutions that enable healthcare marketers to create patient-centered communications that produce measurable results.